It started the night before a routine scan. Something was nagging at me. We had just bought a house and hadn’t yet sold our own property. I was 5 months pregnant. All a little stressful, but that wasn’t it. Instinct was telling me something wasn’t right. At the scan the radiologist smiled kindly at me. “I’m going to get your doctor.” Never something you want to hear. We were told our baby would have a 1 in 100 chance of survival – in Australia babies born before 24 weeks are not resuscitated because their quality of life is poor. If they survive, they have a 1 in 100 chance of being ‘in-tact’, meaning they will most likely have some minor movement and developmental problems requiring ongoing treatment, but they will not be severely disabled or developmentally delayed. At 23 weeks it was utterly hopeless. I started watching the clock, hoping I could make it another minute without giving birth. One minute. Still pregnant. 60 more ticks. Still pregnant. Keep going. Eventually 5, then 10. I watched the clock incessantly, filled with a deep slow moving dread that swept over me in waves. All I could do was watch the clock and wait for the imminent heartbreaking loss. I was inconsolable, but the doctor said, “Please don’t blame yourself, it’s just one of those things.” I cried and cried. There was no one else to blame. My baby was healthy. I was healthy. And yet I was completely incapable carrying her to term like everyone else did. My body was about to kill her by going into labour. I loved her so much already. How would I say goodbye? Why couldn’t my body do this? Of course there was a tiny hope that she would defy the odds and be the one-in-a-million that gets through unscathed. Doctors can be wrong. It occurred to me that she might survive but not be ‘in-tact’. I had a sick brother growing up who lived a very painful life for two years before he slipped away. I remember things I didn’t ever want my son to see. I knew the uncertainty of spending weeks at a time away from my parents, the confusion of waking up in the middle of the night to a neighbour in your home because they had to rush to the hospital. The breathtaking fear of witnessing a convulsion. I realised what I was most afraid of – What if she survived and was really sick? Over time we began to come to terms with the impending loss. We were empty, but somehow looking forward. It would be over soon, and I knew I would see my little boy again. I kept thinking of the image of my son waving goodbye that morning as I drove off to my scan – the image was imprinted in my memory. The hospital I was in was a ‘level 2’ neonatal hospital, so my doctor spent days on the phone trying to get me a bed in a ‘Level 3’ unit in the unlikely hope I would make it to 24 weeks. 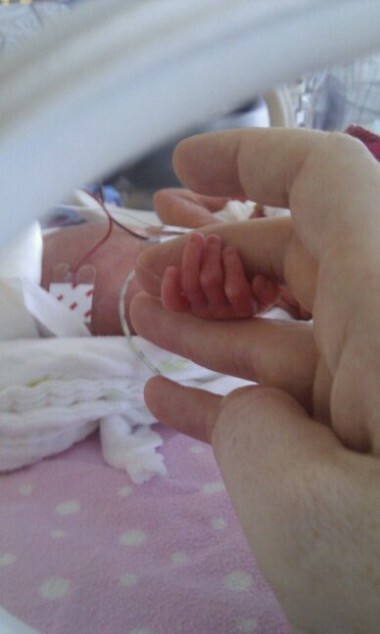 I needed to be there when she was born to give her any hope, but beds for neonatals are a precious commodity. He called every Level 3 hospital in the country. Finally, through calling in several favours with an old university buddy he managed to find us a bed. This man is now my hero and I owe him, in part, my daughter’s life. But at the moment he told me he had found us a bed, although I knew I should be jumping for joy at this tiny strand of hope, I felt nothing but anger. I had come to terms with her passing. In my mind it was a done deal. I had processed the self doubt, the anger and frustration, the utter disgust with my body that had always been so fit and strong and was now betraying me in the worst way possible. I was at peace, fragile though it was. But Dr Peters convinced us to give it a shot. The day I went into labour the doctors assumed it was because of the bulging membranes identified on the scan. They were content to let nature take its course and let me give birth naturally, as they didn’t think there were any added risks to consider. But there was that voice guiding me through the darkness. For some reason, some instinct I can’t explain, I knew I had to have a c-section. The doctors all looked at me as if I was crazy, but respected my wishes. I did really want to do it naturally but I just knew, inexplicably, that I needed to have a caesarean. My baby was born at 27 weeks due to a placental abruption, not bulging membranes. It is life threatening, particularly if born naturally. Purely by chance I was in arguably the best hospital in Australia for neonatal medicine with access to the very best obstetricians and neonatologists. There were dozens of people in the room that night, most of them for my baby. Remarkably, Lucy was breathing on her own. And as luck would have it that instinct to have a c-section possibly saved my daughter’s life. Lucy was in hospital for 4 months, on and off ventilators, CPAP and oxygen, had several bouts of steroids and antibiotics, as well as a life threatening staph infection, which nearly broke my heart into a million pieces. We thought the long days in the hospital would never end. She fought her ventilator, extubated herself, but gradually recovered. And she fought – oh how she fought. Last month Lucy turned 1. She had dozens of specialists check on her progress and was officially given the all clear. Today I took my kids down to the park and watched them run around with our dog. I watched Lucy push her big brother over, roll around in the mud and go down the slippery-slide, all with a cheeky grin on her face. And as the sun shone through the clouds two things occurred to me. She is perfect. And thank God I listened to my instincts – I will never question them again.